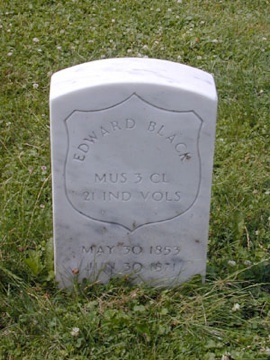 Edward Black was born in 1853, and on July 24th, 1861 he signed up with the 21st Indiana Volunteers’ 1st Regiment as their drummer boy. At 8 years old, it is believed to this day that he was the youngest Union Army solider, and the youngest ever since to enlist in the armed services. Drummer boys were in use before the Revolutionary War to maintain a “pace” or rhythm for marching or charging a line. 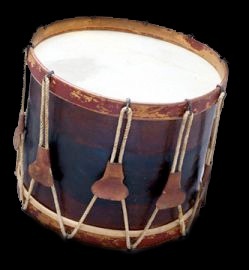 By the time of the Civil War their use had started to decline, and in 1862 President Lincoln ordered that drummer boys be discontinued in order to stem the tide of young boys being killed in the war. The drummer boy was often out in front of the advancing troops, and the enemy often aimed at them in order to cause the advancing line to fall out of step. 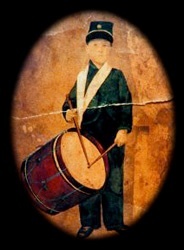 Edward’s Civil War drum, now in the collection of the Children’s Museum of Indianapolis. Edward went home to Indiana as ordered but didn’t stay for long – he re-enlisted again with his father that very same year, and they both served until the war’s end. He was taken prisoner in the Battle of Baton Rouge but survived to be a Civil War veteran at the ripe old age of 11. Unfortunately, he died at age 19 in 1872, never having full recovered from the traumatic experience of war. He is buried in Section 16, Lot 148. 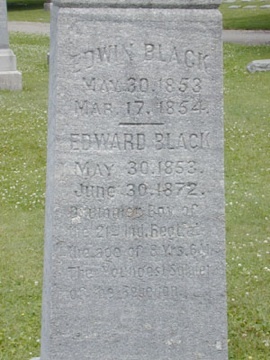 Interestingly, Edward’s stone is in much better condition than his brother Edwin’s, and the dates of death for Edward on the obelisk and the headstone do not match – one states 1871 and the other 1872.
there should be more write more!!!! This helped me get the information I needed. Thank you!